The safety data sheet, also known as an SDS, is an essential component of the OSHA Hazard Communication Standard and of a worker’s right to know about the chemical hazards at his or her workplace. In this article, we’ll explain what an SDS is, how it’s related to a Material Safety Data Sheet (MSDS) and to the GHS-alignment of Haz-Com, what you’ll find in its sixteen different sections, and even give you some additional information about SDSs, including issues related to employer responsibilities and employee access. 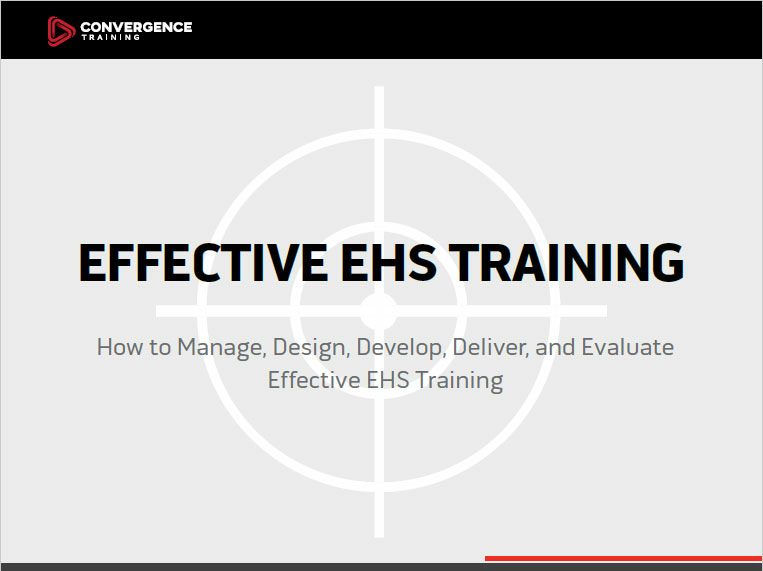 Convergence Training provides online safety training courses, learning management systems, and incident investigation software. Explore the links below to learn more about what we do. In 2012, OSHA changed their existing Hazard Communication, or Haz-Com, regulation, to more closely align with the Globally Harmonized System, or GHS. As part of that change, OSHA replaced the old, pre-2012 material safety data sheets, also known as MSDSs, with the new, post-2012, GHS-aligned safety data sheets, also known as SDSs. 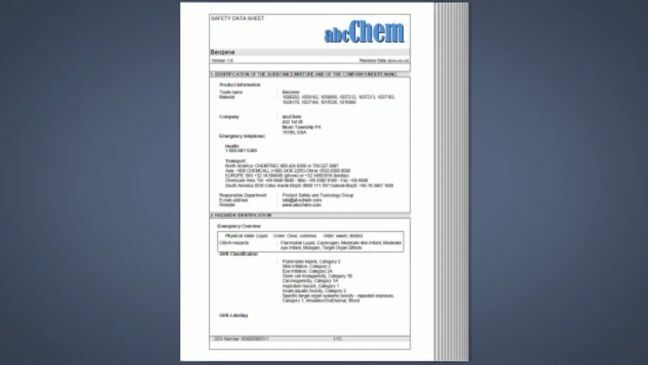 The primary benefit of the new safety data sheets, or SDS, is that the safety information about the hazard chemical would appear in a consistent, standard, uniform, and easy-to-understand order. There are the 16 sections of the safety data sheet, or SDS. This sample from our online Hazard Communication training course explains the different sections of an SDS. Identifies the chemical and provides contact information of the supplier. Identifies the hazard(s) of the chemical and gives appropriate warning information associated with those hazards. Identifies ingredients in the product, including impurities and stabilizers. Includes information on substances, mixtures, and all chemicals where a trade secret is claimed. Required information for substances, mixtures, and chemicals where are trade secret are claimed are listed below. The concentration, expressed as exact percentages, of each ingredient. Alternatively, “concentration ranges” may be used (1) for trade secret claims, (2) where there is batch-to-batch variation, or (3) when the SDS is used for a group of substantially similar mixtures. For chemicals where trade secrets are claimed, must include a statement that the specific chemical identity and/or concentration (expressed as an exact percentage) of composition has been withheld as a trade secret. Describes initial first-aid that untrained responders should provide to a person who’s been exposed to the chemical. Lists recommendations for fighting a fire the chemical causes. Advice on specific hazards that develop from the chemical during a fire. For example, any hazardous combustion products created. Includes information on responding to spills, leaks, or releases, including containment procedures and cleanup practices. May also include recommendations that distinguish between efforts for large and small spills when spill volume has a significant impact on the hazard. Recommendations on safe handling practices and conditions for safe storage. Lists exposure limits, engineering controls, and personal protective measures that can be used to reduce worker exposure. OSHA Permissible Exposure Limits (PELs), American Conference of Governmental Industrial Hygienists (ACGIH) Threshold Limit Values (TLVs), and any other exposure limit used or recommended by the chemical’s manufacturer, importer, or employer preparing the SDS. Lists the physical and chemical properties. The SDS may omit one or more of the items listed above if it is not relevant or available. When that happens, though, a notation must be made. In addition, manufacturers may add other relevant properties. An example would be the dust deflagration index (Kst) for combustible dust. The SDS may not contain every item on the above list because information may not be relevant or is not available. When this occurs, a notation to that effect must be made for that chemical property. Manufacturers may also add other relevant properties, such as the dust deflagration index (Kst) for combustible dust, used to evaluate a dust’s explosive potential. Describes the chemical’s stability information and reactivity hazards. This section is broken into three smaller sections. Required information is explained below. Describes specific test data for the chemical(s). Data can be for a class or family of the chemical. Indication of the possibility of hazardous reactions, including a statement whether the chemical will react or polymerize, which could release excess heat or pressure, or create other hazardous conditions, as well as a description of the conditions under which hazardous reactions may occur. A list of any known or anticipated hazardous decomposition products that could be produced because of use, storage, or heating. These should also be listed in Section 5 of the SDS, which covers fire-fighting measures. Lists the toxicological and health effects information, or indicates that the data is not available. Likely routes of exposure, such as inhalation, ingestion, skin contact, and/or eye contact. Must also indicate if the information is unknown. Indication of whether the chemical is listed in the the latest edition of the National Toxicology Program (NTP) Report on Carcinogens or has been found to be a potential carcinogen in the latest edition of the International Agency for Research on Cancer (IARC) Monographs or found to be a potential carcinogen by OSHA. This section is not mandatory on the SDS. It provides information to help evaluate the environmental impacts of the chemical once its released into the environment. Another non-mandatory section, this one provides guidance on disposal practice, recycling or reclamation of the chemical and/or its container, and safe handling practices. This section should also refer to Section 8 on Exposure Controls and Personal Protection. Yet another non-mandatory section, this one lists guidance on classification information for shipping and transporting. Packing group number, if applicable. This is based on the degree of the hazard. And yet another non-mandatory section, this one lists any EHS regulations specific for the product not indicated elsewhere on the SDS. Indicates when the safety data sheet was prepared or when the last known revision was made. May also explain what changes were made from last version. May also include any other useful information. Well, that’s a LOT of information about safety data sheets, but we’ll add a few more points below. The employer shall maintain in the workplace copies of the required safety data sheets for each hazardous chemical, and shall ensure that they are readily accessible during each work shift to employees when they are in their work area(s). Safety data sheets, also known as as SDSs, are a continuation of the OSHA Haz-Com’s regulations to guarantee an employee’s “right to know” about the chemical hazards in their workplace. This online hazard communication training course is a good addition to your employee HazCom training program to help employees know just that. Let us know if you have more questions about safety data sheets or the OSHA Hazard Communication regulation. And don’t forget to download the free guide below. What Is a Hazard Communication Signal Word?